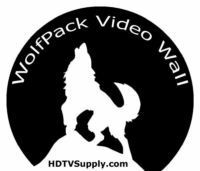 HDTV Supplys WolfPack 4 Output Video Wall Display is a powerful and fully real time data/video processor for 4-flat panel displays or projectors. With the most flexibility on the input side, the unit accepts one VGA, DVI, CVBS, S-Video, and YPbPr signal and splits that input onto the connected 4 displays showing one large picture. 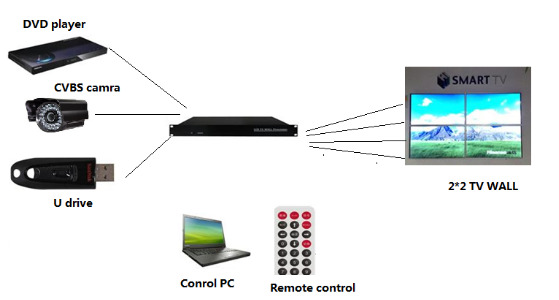 The 4 screen wall processor is an advanced video device for multimedia presentations. It has four HDMI outputs to go to 4 - widescreens showing one large picture. You will also need 4-matched TVs and wall mounts (not supplied). Subtitle Function: With our WolfPack 4 Output Video Wall you can scroll sub-title words like ABC Company on a USB drive and plug the USB drive to the USB port and turn on the 4 Output Video Wall Processor. Press number 0 on the remote control and then follow below steps: MENU --> ROLL TET --> OK, its that easy. You can even adjust the word size, color, background and the scrolling speed. Functions perfectly as video screen splitter, video converter and video switcher. The 4 Output Video Wall allows you to manipulate input videos to a position and size you want for viewing. The embedded scalar converts signals from input sources to match the native resolution of monitors, flat panel displays, projectors. 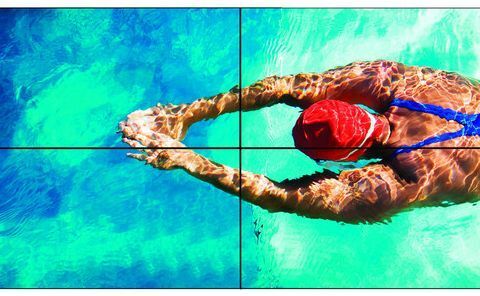 The 4 Output Video Wall sends the resulting mixed video thru HDMI interface to the connected 4 - widescreens or projectors based on the display layout. The layout can be readily modified to fit your applications and optimize visual effects. Typical applications include digital signage, and broadcasting/education/ surveillance systems etc. Why not buy this 4 Output Video Wall today ? Why not buy this 4 Output Video Wall today? We have a unit that was used in our lab that has a scratch on the bottom that works flawlessly for $300, shipped. Call Kent at 800-841-9238 if you are interested. Q: Will this Video Wall processor show 4-different pictures?